Industrial computer Enclosures for computer protection against dust, dirt, liquids, theft and vandalism. Industrial computer Enclosures protect PC and computer hardware in industrial and commercial applications, ensuring security of computer and electronic equipment. PC Guard have a range of high quality products to suit many industrial and commercial applications from Industrial enclosures to Industrial waterproof stainless steel computers sealed to IP65. PC-Guard's industrial computer enclosures will ensure that desktop PC's in hostile environments are safe and will continue to operate properly. This protects your investment in the PC and protects against lost production time. 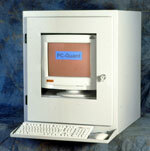 At PC guard you get a better and cheaper solution when you buy a PC Guard enclosure. We specialise in the design and manufacture of PC enclosures so we design out any extra cost that you may have to find elsewhere and also drive down manufacturing overheads.